2. “Repeated exposure is the simplest and most convenient method to enhance vegetable intake in children. . . However, mothers often give up after only 5 exposures yet current recommendations suggest at least 8–10 exposures.” (See study here.) So, we are just not being persistent enough. 3. A food “exposure” needn’t be anything beyond a spoonful. If you get your child to sample even a tiny taste of a food eight or more times, they will eventually start to accept its taste. This isn’t to say that they will end up loving the flavor of every vegetable there is, but that you need to patiently build their taste library. 4. Kids are most open to new flavors before they reach age two, at which time food “neophobia” (literally: fear of the new) sets in. Children aged 2–6 are most likely to experience neophobia, even though this can be overcome with patience and repeated exposure. 5. 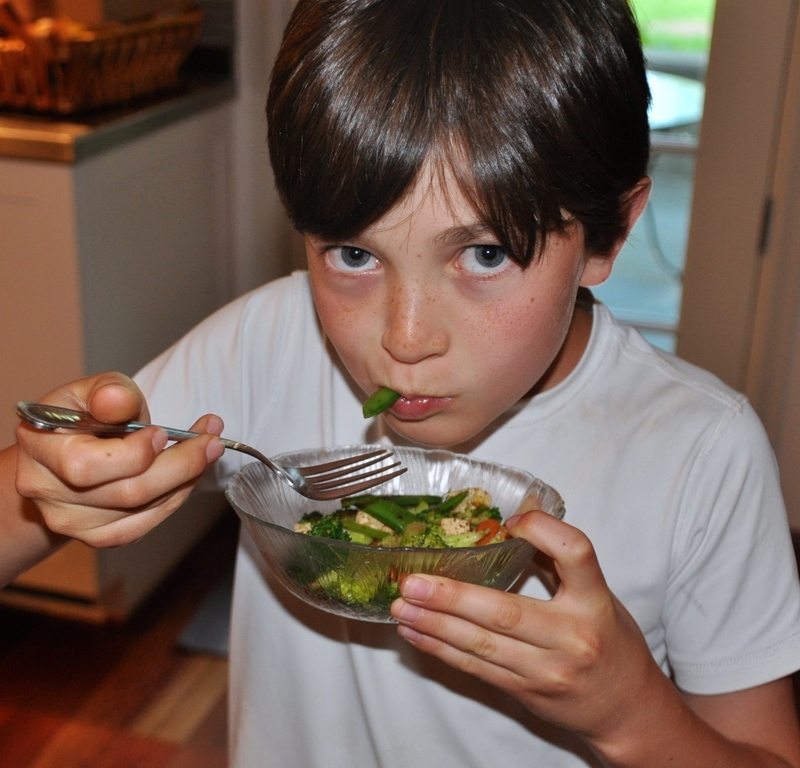 Kids will eat more healthy and fewer unhealthy foods if you balance their portions correctly. This is common sense but bears stressing. So, if you give your child a heaping portion of, say, noodles, alongside a regular serving of green beans, she will eat the pasta and save very little, if any, room for the vegetable. Children fed more modest portions of things like chicken and noodles alongside their fruits and vegetables will consume more produce overall. 6. Children carry their nutrition habits with them into adulthood. This has always been my mantra. I know many adults who sadly refuse to eat vegetables, hate salad, and live on meat and processed carbs. Children reared on a “Kids’ Menu” diet, devoid of balance and plant-based foods, will never develop a healthy palate or the skills they need to feed their bodies to avoid weight-gain, low energy, and chronic illness. We do our kids a huge disservice by handing the reigns of their nutrition education over to agri-business, which is more than happy to train them to shun fresh food in lieu of the sugar-salt-oil trifecta. The latest studies should not intimidate us, but rather inspire us to step up our efforts in teaching our children how to feed themselves. You probably go to great lengths to educate your child in all the areas he or she will need to succeed as adults—from reading and math to ethics and etiquette. Don’t overlook this equally critical subject. It is our responsibility to educate kids on how to respect and care for their bodies. To paraphrase a saying I love: If we don’t teach kids to keep their bodies healthy and strong, where on earth will they live?